October 31st, 1517, was one of the turning-points in the history of the world. On that day Martin Luther nailed his 95 Theses to the door of the Wittenburg Church, and with that deed the Protestant Reformation was born. A Night of Reformation will help your church, homeschool support group or Christian school replace Halloween with an exciting Reformation Day celebration. This 3-ring notebook includes complete plans for four different Reformation Night events, two celebrating the life of reformer Martin Luther, one focusing on John Calvin, and one on Martin Bucer. We also give guidelines for researching and organizing additional parties recognizing the work of other reformers. Watch this video and photo slideshow from our past Reformation Day celebrations! Along with a script for a short play about Martin Luther, the book includes detailed instructions, illustrations, and materials lists for fun and creative group games, carnival booths, and craft projects that help to illustrate different aspects of each reformer's life. 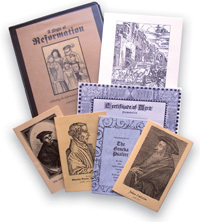 Teach the history of the Protestant Reformation in a fun and memorable way. Help Martin Luther's future wife escape from her convent, encourage Calvin's friend Farel as he tosses the Catholic priests' relics into the river, assist Martin Bucer as he attempts to negotiate a peace between Ulrich Zwingli and Martin Luther. Costumes, games and booths, prizes, food, teaching, singing and fellowship -- our church's Reformation Party is one of the highlights of our year! The notebook edition of A Night of Reformation includes the pictured sample programs and extra materials to help you organize your own Reformation Night. 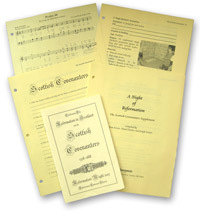 Plans for a Scottish Covenanter Reformation Night are also available as a supplement to A Night of Reformation. Thank you, Doorposts, for your thorough godly resources. What a fantastic resource for single family, homeschool group or church. This is the reason for the season to celebrate our faith and the reforms made in church history beginning on October 31st. The package put together gives tons of ideas and you can keep it growing! Thank You for this compilation and the chance for Christians to celebrate a night in the light in spite of the darkness of Halloween. Just wanted to let you know this was the second year that we had a "Reformation Party" using your awesome resource! Last year I tried it with only my 7 children and three from across the street. 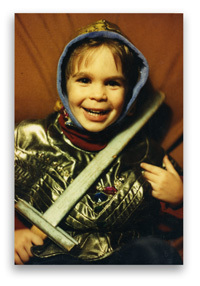 They all loved it and begged to do it again this year (They were ages 7-17). This year they put together all the games and we studied John Calvin. We had almost 30 at our house and every one can't wait until next year. Thank you for such a wonderful resource! We not only learned a lot, but it was a great experience as a family and for our children serving younger ones. The ministry opportunity was invaluable. WOW! I LOVE this resource! It has inspired me to teach my children what these great men and women fought so hard for. Last year we kept it simple. My sons were dressed as noble knights (using the pattern also from doorposts) for our home Reformation party. We ate medieval food, turned the lights down low and lit lots of candles. Some friends from church came and we watched a movie from visionvideo.com called God's Outlaw about William Tyndale. This year we're expanding it a little more by watching the new Luther movie, singing some of his hymns (from the Night of Reformation book), eating medieval food again, and having friends over. My husband is a pastor, and he hopes that next year at church we can do something like one of the Luther parties suggested in this manual. If you love the Reformation, you will love this book. It's so practical and has a wealth of information to make celebrating October 31 purposeful. I am so thankful for Pam putting this together!